Everyone once in a while you are driving along and you see someone driving very aggressively. You know, they zoom past you, accelerate hard, weave in and out of cars, just trying to get ahead. If it was a race and it was a straight line with no stop lights this might actually save time but because there are traffic lights on the road, it really does not help much. There have been so many times where cars have tried to speed ahead only to jam on their breaks when the reach the next red light. Then everyone else casually pulls up behind them at their normal safe driving speed. They will continue to do this, trying to get around as many cars as they can. Sometimes I will count the time they have saved by counting how many seconds they are ahead. After a mile or so of aggressive driving they will have saved about 5 or 10 seconds total. I want to ask them, "What are you going to do with that 10 seconds you saved?" Was it worth wasting gas accelerating hard and wearing down brake pads by jamming on the brakes? Was it worth making the roads more dangerous by weaving in and out of cars trying to get ahead? The answer is no. It is not worth all those things to save a few seconds. I understand sometimes people are in a hurry. Maybe they are late for work. Maybe they are late for a meeting. In times like these it is understandable for people to want to drive faster. They have a good reason to do so, but that does not make it right and it still does not save much time in the big picture. 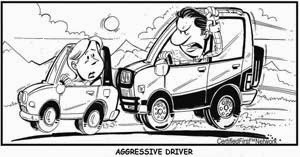 The roads would be safer if everyone would understand that aggressive driving does not really save much time but it does compromise the safety and well being of the driver doing the speeding as well as the other drivers on the road.